The Clarets are going on a European tour! 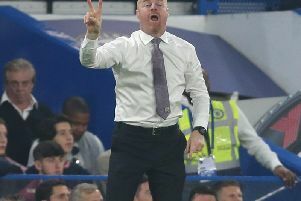 Burnley have secured a place in the qualifying rounds of the Europa League after guaranteeing a seventh place finish in the Premier League. The Clarets, who have relinquished their position just once since Christmas, following a 1-0 defeat against Manchester United at Turf Moor, will enter at the second qualifying stage after Everton's stalemate with Southampton ensured that they can't be usurped. The draw will be made in Nyon on June 19th, just five days after the release of the Premier League schedule and the start of the World Cup, with the first leg taking place on July 26th, with the second leg to follow on August 2nd. Sean Dyche's side, however, could jump straight in at the group stages of the competition, should they pip Arsenal in to sixth position. Victory over the Gunners in Arsene Wenger's last game in charge at the Emirates would draw them level on points, though this year's Europa League semi-finalists would still have a game in hand. It will be the club's first taste of European football in 51 years when, under the management of Harry Potts, the Clarets reached the quarter-finals of the Fairs Cup, losing out 3-2 on aggregate to West Germans Eintracht Frankfurt.